ALESSANDRO ALIVERTI graduated in Biological Sciences in 1986 and obtained a PhD in Molecular and Cell Biology in 1990 at the University of Milano. In 1989 he was at the Ludwig-Maximilians Universität of Munich, Germany, as a research associate. From 1991 to 2004 he carried out research and teaching activities at the Department of General Biochemistry and Physiology, University of Milano, initially as a Research Scientist and later as an Assistant Professor (Ricercatore). 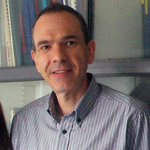 Since 2005 he is Associate Professor at the Department of Biomolecular Sciences and Biotechnology. The scientific interests of Prof. Aliverti span several areas of biochemistry and molecular biology, including enzymology of flavo- and iron-sulfur-proteins, protein-protein interactions, biochemistry of pathogenic microorganisms. He is currently focousing on the study of the structure-function relationships of enzymes involved in various human pathologies (including neurodegeneration, essential hypertension, and malaria) as a prerequisite of rational drug design. His scientific expertise combines a wide experience in protein biochemistry and enzyme kinetics, with a solid background in the technologies involved in recombinant protein production, purification and engineering. Alessandro Aliverti is engaged in several national and international collaborations. To date, he has coauthored 50 full-length publications in peer-reviewed international journals and 25 chapters in books. Pennati, A., Zanetti, G., Aliverti, A., and Gadda G. (2008) Effect of Salt and pH on the Reductive Half-Reaction of Mycobacterium tuberculosis FprA with NADPH. Biochemistry 47, 3418-3425. Aliverti, A., Pandini, V., Pennati, A., de Rosa, M., and Zanetti, G. (2008) Structural and functional diversity of ferredoxin-NADP+ reductases. Arch. Biochem. Biophys. 474, 283-291. Balconi, E., Pennati, A., Crobu, D., Pandini, V., Cerutti, R., Zanetti, G., Aliverti, A. (2009) The ferredoxin-NADP+ reductase/ferredoxin electron transfer system of Plasmodium falciparum. FEBS J. 276, 3825-3836. Crobu, D., Canevari, G., Milani, M., Pandini, V., Vanoni, M.A., Bolognesi, M., Zanetti, G., and Aliverti, A. (2009) Plasmodium falciparum ferredoxin-NADP+ reductase His286 plays a dual role in NADP(H)-binding and catalysis. Biochemistry 48, 9525-9533. Grellier, P., Maroziene, A., Nivinskas, H., Šarlauskas, J., Aliverti, A., Cenas, N. (2010) Antiplasmodial activity of quinones: roles of aziridinyl substituents and the inhibition of Plasmodium falciparum glutathione reductase. Arch. Biochem. Biophys. 494, 32-39. Pandini, V., Ciriello, F., Tedeschi, G., Rossoni, G., Zanetti, G., Aliverti A. (2010) Synthesis of human renalase1 in Escherichia coli and its purification as a FAD-containing holoprotein. Protein Expr. Purif. 72, 244-253. Milani, M., Ciriello, F., Baroni, S., Pandini, V., Canevari, G., Bolognesi, M., Aliverti, A. (2011) FAD-Binding Site and NADP Reactivity in Human Renalase: A New Enzyme Involved in Blood Pressure Regulation. J. Mol. Biol. [Epub ahead of print] PMID: 21699903.